Rep. Keith Ellison will no longer be participating in the MAS-ICNA annual convention next week. PHILADELPHIA – Dec. 22, 2016 – Rep. Keith Ellison (D-MN), the leading candidate to head the Democratic Party, has withdrawn, under pressure from the Middle East Forum and its allies, from an Islamist convention in Chicago on Dec. 27. Rep. Ellison was scheduled to speak at the Muslim American Society (MAS) – Islamic Circle of North America (ICNA) annual convention alongside a variety of extremist speakers. On December 15, MEF and other allied organizations circulated research on several dozen speakers due to share a platform with Rep. Ellison to national media outlets. Today, MEF spoke with a representative from MAS-ICNA who acknowledged that Ellison has opted out of the event. MAS is a radical Islamic organization that has been criticized by the Anti-Defamation League as being anti-Semitic, anti-Israel, and pro-terrorism. ICNA is the American arm of the Pakistani Islamist group Jamaat e-Islami (JI), which has been repeatedly accused by Pakistani officials of links to terrorism. Almost half of the speakers have made outrageous comments advocating for jihad, promoting anti-Semitic and anti-Israel propaganda, and praising terrorist groups such as Hamas. The speakers at the MAS-ICNA convention include Osama Abu-Irshaid, the national director of American Muslims for Palestine, who recently wrote on Facebook that the terrorist group Hamas is "an army for liberation." Also speaking is Siraj Wahhaj, whom the U.S. Attorney for New York listed as an unindicted co-conspirator in the 1993 World Trade Center bombing, and Mohammad Qatanani, who is currently facing deportation charges connected to his undisclosed membership in Hamas. 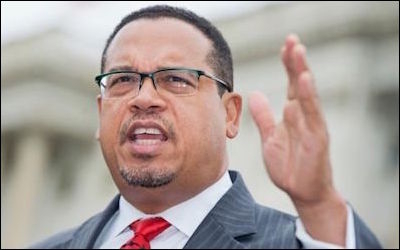 "By speaking on the same platform as these radical Islamists, Ellison would have stood with people who oppose American values and promote deeply illiberal, bigoted, and violent ideas," said Gregg Roman, director of MEF. "I'm waiting for him to go further and condemn the views of the extremist speakers who remain on the billing." Daniel Pipes, MEF's president, said, "If Rep. Ellison truly wants to do what is right for the country and for our American values of democracy and tolerance, he must disassociate himself from all future MAS and ICNA events, as well as disavow the odious ideology that the other convention speakers espouse." Related Topics: Muslims in the United States, Muslims in the West receive the latest by email: subscribe to the free mef mailing list This text may be reposted or forwarded so long as it is presented as an integral whole with complete and accurate information provided about its author, date, place of publication, and original URL.